The Hunter is one of Nassau’s most high quality and top rated fishing vessels. This 42-foot Hatteras provides the perfect setting for a Bahamas offshore fishing or light tackle excursion. The boat is big enough to hold up to 7 guests and comes fully equipped with fishing chairs and only the best fishing gear and tackle including Penn 2 Speed Internationals and Shimano Tld’s. 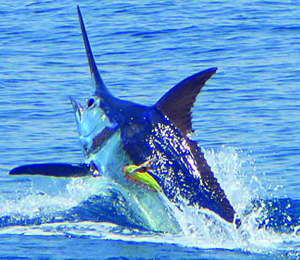 If you are looking for only the best when it comes to Nassau fishing, then you have come to the right place! Here at Fish in the Bahamas, we take fishing seriously! We work only with the most dedicated, passionate, and experienced of local fishing guides to make sure that you are provided with the best fishing trip possible! The Hunter fishing vessel is led by a Nassau native, Captain Paul, and his hand-picked team of fishing captains. This team will be able to lead you to some of the best catches! And the fishing here in Nassau is great throughout the year. So whether you are coming in the winter, summer, spring or fall, you will be sure to go after some of the best game species of the Bahamas! Some of our most regular catches here at Fish in the Bahamas include amberjack, swordfish, dorado, grouper, permit, shark, snapper and wahoo, just to give you an idea of a small sampling of what you can expect. The 42-foot Hunter also takes luxury to the next level, offering guests a comfortable and fully air-conditioned saloon with a pullout couch, chairs, and even a galley with a stove, fridge and sink. We provide all of your fishing gear and equipment, but if you want to bring a couple beers, snacks, or other drinks on board, you are more than welcome to! Captain Paul and his team will be ready to take you on a light tackle fishing trip a couple miles offshore, or you can go to the deep blue waters of the Bahamas for some deep-sea offshore fishing. Whatever type of fishing you want to do during your visit to the Bahamas, we will do everything we can to make it happen for you! I have been to the Bahamas many times, but The Hunter - 42' Hatteras is one of my favorite trips! It includes everything that everyone should do here. As a Bahamas veteran, I can say only the best about this experience!